50th Anniversary - Did you attend the school? The original Dukeries Comprehensive School was built in 1964 on a campus which had excellent physical education and recreation provision, workshops, science and craft facilities. At its peak the school accommodated 1800 students. In the 1980s the county council was facing significant declines in student numbers and, in consultation with the Department of Education & Science, produced an imaginative plan to remodel the school over three years. The project was completed in 1985, with the school redesignated as a Community College within a broader-reaching Dukeries Complex. The Dukeries Complex rapidly became a unique federation of organisations providing education for all, recreation, youth work, information and library services together with care services for the very young, the elderly and for those with learning disabilities. The complex featured an FE College, a Day Centre for Older People, a Young People’s Centre, Ollerton & Boughton’s Children’s Centre, a Construction Centre, an indoor and outdoor horse-riding centre (incorporating the Dukeries RDA), a community theatre, a Leisure Centre, a Community Workshop, a hair salon, a beauty training room, a motor vehicle workshop, a public library, a Day Centre for Adults with Learning Disabilities, Nottinghamshire Fire Training Centre, Nottinghamshire’s Registrar Service and Notts Homecare (a social enterprise) on our site. The complex proved effective in securing additional external funding to further develop facilities and services. The theatre was been refurbished and hosts a variety of dramatic and musical events, whilst a £1m investment from the Sports Lottery resulted in floodlit all-weather pitches and tennis courts. The forward-looking enviro-centre (opened by Prince Edward), and Construction Centre (opened by Ed Balls) have also resulted from successful bids. The Dukeries College of Further Education was started in 1983 and now delivers a wide range of learning opportunities for those aged 16 and over. The main provision is in Childcare, Health & Social Care, Construction, Skills for Life (Functional Skills), Administration and IT, but we also offer a range of short courses in leisure activities such as painting and drawing and foreign languages, as well as apprenticeship training and Access to Higher Education courses. Dukeries FE has its own accommodation on site and access to all specialist areas when not in use by the Academy. With its image and reputation improving all the time, the college chose to become a sponsored Academy (from January 2013) in partnership with the Academies Transformation Trust. Working with ATT, we have committed to the ATT vision for all their sponsored schools of providing ‘An Outstanding Education for All’. Many changes are in hand and planned to support achieving this vision. 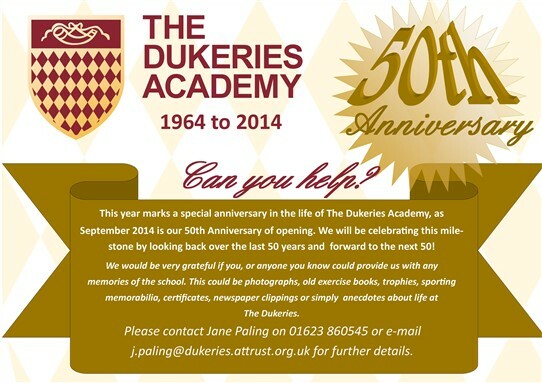 Do please visit our website, at www.dukeriesacademy.attrust.org.uk, to find out more about us. This page was added by Jane Paling on 23/01/2014. I attended between1970/76 all I remember is Mr apply and miss West but good time the dukeries youth club.